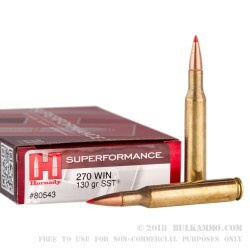 .270 Winchester ammo is the Grand Old Man of North American hunting cartridges, and now it’s been upgraded with Hornady’s premium SST hunting bullet. Originally developed in 1923, the .270 Winchester has been used to take every animal that walks on 4 legs in North America, and almost 100 years later it’s still a great choice for hunting. 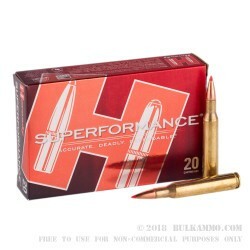 Hornady’s unique SST bullet maximizes expansion while keeping the bullet intact for optimal weight retention. 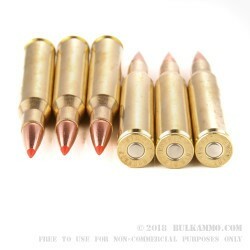 At 3,000 feet per second, these .270 Winchester rounds deliver over 3500 joules of kinetic energy to the target. Hornady’s quality control processes are only slightly less elaborate than a Japanese Tea Ceremony, which is good for the shooters because it means that these rounds will be accurate, and reliable. After all, 3500 joules doesn’t matter if the round misses. 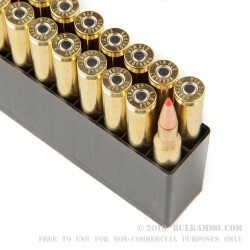 Hornady loads their SST bullet into brand new .270 Winchester brass for these rounds. These top notch hunting rounds are packaged in boxes of 20, with the rounds coming in slotted plastic trays for ease of access.